Department of Botany 1, Cell Culture Lab, Union Christian College, Aluva, Ernakulam - 683102, Kerala, India. Nupal Remedies Pvt. Ltd. 2, Ernakulam - 682020, Kerala, India. ABSTRACT: Cissus latifolia Lam. (Vitaceae) is a woody climber with leaf-opposed tendrils. It is a medicinal plant used in the traditional system of medicine for the treatment of various ailments. 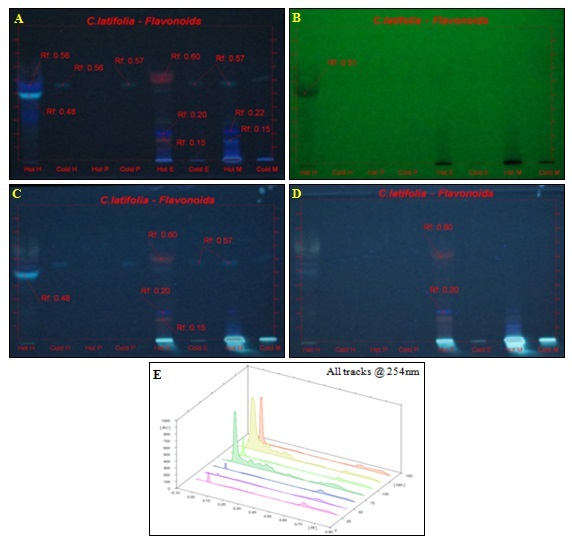 The present study focused on the identification and qualitative determination of phytoconstituent types and establishment of the HPTLC fingerprint profile of the hot and cold extracts of C. latifolia. Preliminary phytochemical screening was done to identify the class of compounds present. HPTLC analyses of eight different extracts were carried out with the most suitable mobile phase system using the Camag HPTLC instrument consisting of Linomat- V automated spotter having a 100 μl syringe connected to a nitrogen cylinder, twin-trough developing chamber, scanner-III and viewing cabinet with dual wavelength UV lamps (Camag, Muttenz, Switzerland). Qualitative phytochemical screening revealed the presence of flavonoids, coumarins, tannins, alkaloids, steroids, terpenoids, saponins, quinines, anthraquinones and phenol in the stem of C. latifolia. The HPTLC profiling of eight different extracts showed the presence of alkaloids, flavonoids, phenols, saponins, and tannins with different Rf values. The results of preliminary phytochemical screening and HPTLC fingerprint obtained from this study can be used as a reference for the standardization and quality control of Cissus latifolia stem. INTRODUCTION: According to Angiosperm Phylogeny Group IV classification, the family Vitaceae consists of two subfamilies Vitoideae (Eaton) and Leeoideae (Burmeister) 1 and Cissus is the largest genus in the family with about 350 species 2. Cissus L. is seen widely distributed in the tropical regions such as Africa (ca.135 species), Southern Asia (ca. 85 species), Australia (ca.12 species) and the Americas (77 species) 3. C. latifolia is a woody climber with leaf-opposed tendrils, which may be modified to form an inflorescence. Cissus is a therapeutically important plant as many of its species are reported to have medicinal properties and is used in traditional medicine for treating various diseases. C. latifolia Lam. and C. quadrangularis L. is used in the treatment of weak bones, bone fractures, cancer, scurvy, peptic ulcer disease, hemorrhoids, malaria, pain and asthma 4. The diverse medicinal properties of the genus Cissus such as antidiabetic, anti-inflammatory, anti-snake venom, anti-cholesterol, anti-viral, anti-cell proliferative, anti-dysenteric and anti-microbial were reviewed 5. C. aralioides is used in Cameroon traditional medicine as a toxicological and anti-microbial agent against microbes infecting urogenital and gastrointestinal tracts 6. A recent review revealed the anabolic, androgenic, antioxidant and bone healing activity of C. quadrangularis 7. According to Soladoye and Chukwuma, C. populnea is used in different states of Nigeria for making a vegetable soup to stop postnatal bleeding 8. The therapeutic use of different plants from the genus Cissus suggests that these plants can serve as a good source of medicines. According to WHO guidelines, chromatographic fingerprints such as TLC, HPTLC, HPLC, GC, and hyphenated techniques can be used in the identification and determination of adulteration in herbal drugs 9, 10. HPTLC fingerprint can be utilized as a phytochemical marker and as an estimator of genetic variability in plant population 11. The present study aims to point out the presence of major phytoconstituents and to develop a quality control standard fingerprint for different extractive fractions of C. latifolia stem. Collection, Identification, and Preparation of Plant Materials: The fresh stem of C. latifolia was collected from Muvattupuzha, Ernakulam District of Kerala. Taxonomic identification of the plant was done at the Silviculture Department, Kerala Forest Research Institute (KFRI), Peechi and the voucher specimen was deposited in the National Herbarium Collection at KFRI with accession no. 13054. The plant materials were washed, chopped, dried under shade and finely powdered using a blender. Preparation of Extracts: For phytochemical screening 10 gm of the stem powder was mixed with 50 ml of solvents such as petroleum ether, ethyl acetate, and methanol and kept for 48 h with intermittent shaking. The extract was filtered, kept in a water bath for 2 h at 60 ºC and used for further analysis. For HPTLC 10 gm of the powdered sample was taken in a Soxhlet and extracted using different solvents such as hexane, petroleum ether, ethyl acetate and methanol for 8 h (hot extraction). The extract was then concentrated using a rotary vacuum evaporator. For cold extraction, 1 gm powder was mixed with 20 ml of the above four solvents and kept in a sonicator for 20 min. Preliminary Phytochemical Screening: A small amount of the dry extract was used for qualitative phytochemical screening following standard protocols 12. Screening of Phytochemical Groups using HPTLC: Chromatographic fingerprints like HPTLC are widely used for the identification and qualitative determination of bioactive compounds in herbal drugs. HPTLC is an analytical technique that gives fast, reliable and reproducible results when compared with other techniques. The Camag HPTLC instrument consisted of Linomat- V automated spotter having a 100 μl syringe connected to a nitrogen cylinder, twin –trough developing chamber, scanner –III and viewing cabinet with dual wavelength UV lamps (Camag, Muttenz, Switzerland). Pre-coated TLC plates of aluminum backed silica gel 60 F 254 having 0.2 mm thickness was used. Sample extracts were spotted on TLC plates in the form of narrow bands of 8 mm at a distance of 10 mm from the bottom. 10 μl of the sample was applied under a continuous dry stream of nitrogen gas. The development of spotted plates was done using different mobile phases most suitable for each phytochemical. The mobile phase used for the detection of alkaloids was Toluene: Ethyl acetate: Diethylamine (7:2:1) and for flavonoids was toluene: ethyl acetate: formic acid (7:3:0.1). For detecting phenolic compounds, Tetrahydrofuran: Toluene: formic acid: water (16:8:2:1) was used and for detecting saponins chloroform: acetic acid: methanol: water in the ratio 6.4:3.2:1.2:0.8 was used. Ethyl acetate: acetic acid: ether: hexane (4:2: 2:2) was used for detection of tannins. Linear ascending development of TLC plate was performed in a twin trough glass chamber (10 × 10 cm) pre-saturated with 10 ml of the same solvent system. The chamber saturation time was 20 minutes at 25 ± 2 °C at a relative humidity of 60 ± 5%. The plate was developed to a distance of 80 mm from the point of the sample application. The plate was then dried, and the chromatogram was viewed under 254 nm and 366 nm to visualize the phytochemical constituents. Dragendorff’s reagent was used for alkaloids and anisaldehyde sulphuric acid was used for saponins as a derivatizing reagent. For derivatizing flavonoids, Neu’s reagent, i.e. NP/PEG solutions (Natural Products - Solution A: 1% Diphenylborinic acid aminoethyl ester in methanol and Polyethylene glycol - Solution B: 5% Polyethylene glycol 400 in ethanol) was used. Fast blue salt B reagent was used for both tannins and phenolic compounds. These plates were then photographed in varying conditions under UV 254 nm and UV 366 nm after derivatization. The digital densitometric scan was done with Camag TLC scanner III, operated by win CATS software version 1.4.4. HPTLC studies were carried out based on the standard procedures 13, 14. Preliminary Phytochemical Screening: The results of the preliminary phytochemical screening of different extracts of C. latifolia stem (petroleum ether, ethyl acetate, and methanol) are given in Table 1. Screening revealed the presence of flavonoids, coumarins, tannins, alkaloids, steroids, terpenoids, saponins, quinines, anthraquinones, and phenol. HPTLC Analysis: The HPTLC analysis of different extracts from C. latifolia stem showed several peaks of polyvalent phytoconstituents which can be used as a fingerprint for authentication. HPTLC Fingerprint for Alkaloid: The HPTLC spectrum for the eight extracts is illustrated in Fig. 1 which showed very few bands in 254 nm and 366 nm, however, these bands were not distinct under visible light after derivatization Fig. 1D. The densitometric scan showing the Rf values of different peaks were summarized in Table 2. Analysis of hexane (hot) extract revealed eight peaks with Rf values ranging from 0.02 to 0.66. Spots with Rf values 0.66 and 0.02 are majors (38.06% and 27.27% respectively). Hexane (cold) extract revealed only three peaks with Rf values ranging from 0.02 to 0.85. Among them, those with Rf values 0.79 and 0.02 were predominant with 49.27% and 30.98% area respectively. Analysis with petroleum ether hot extract revealed three peaks with Rf values ranging from 0.01 to 0.61. Spots with Rf values 0.01 and 0.61 were majors (65.76% and 21.30% respectively). Petroleum ether cold extract also showed three peaks in which Rf values ranged from 0.01 to 0.83. The predominant Rf values were 0.01 and 0.83 with 52.80% and 24.04% area respectively. HPTLC analysis of ethyl acetate hot extract revealed 4 peaks where Rf values ranged from 0.01 to 0.70. The predominant area percentages (60.58% and 19.20%) were shown by peaks with Rf values 0.01 and 0.04. In the case of ethyl acetate cold extract, there were only 2 peaks with Rf values 0.01 and 0.79 having area percentage of 58.36 and 41.64 respectively. For hot methanol extract three peaks were obtained with Rf values ranging from 0.02 to 0.77. The predominant area percentages were shown by 0.02 and 0.77 with 88.18% and 10.93% respectively. Analysis of cold methanol extract revealed only two peaks. The Rf values of the peaks were 0.01 and 0.78 which showed 68.83% and 31.17% area respectively. HPTLC Fingerprint for Flavonoids: Development of hot hexane fraction produced no peaks whereas in hexane cold fraction three peaks with Rf values ranging from 0.02 to 0.80 was obtained. Area percentage (25.13% to 45.26%) indicated the presence of phytoconstituents in relatively good amount. In the case of both petroleum ether hot and cold fractions, four peaks were observed. The Rf values ranged from 0.02 to 0.68 in the case of the hot fraction. The components with Rf values 0.68 and 0.58 were the majors with area percent 62.78% and 12.85% respectively. For cold fraction, Rf values ranged from 0.02 to 0.79. Spots with Rf values 0.64 and 0.79 are the majors (46.86% and 29.07% respectively). Analysis of ethyl acetate hot extract revealed ten peaks with Rf values ranging from 0.02 to 0.67. Among them, those with Rf values 0.02 and 0.67 were predominant with area percent 51.46 and 9.45 respectively. In ethyl acetate cold fraction only three peaks were obtained. The Rf values ranged from 0.02 to 0.80. The components with Rf values 0.02 and 0.64 were comparatively abundant with an area percentage of 49.07 and 27.18 respectively. The development of hot methanol fraction revealed eleven peaks whose Rf values ranged from 0.02 to 0.79. The component with Rf value 0.02 was the major one with an area percentage of 60.98. For cold methanol fraction, four peaks were observed, and the Rf ranged from 0.03 to 0.80. Spots with Rf values 0.03 and 0.80 were more predominant with area percent 71.53 and 12.84 respectively. The results obtained from the HPTLC analysis of various extracts concerning flavonoids are given in Table 3, and the corresponding figures were represented in Fig. 2. HPTLC Fingerprint for Phenols: The HPTLC fingerprint profile for various extracts showed a distinct band pattern, and it is represented in Fig. 3 and the Rf values of different peaks are given in Table 4. The HPTLC analysis for hot hexane fraction exhibited three peaks, with Rf values ranging from 0.02 to 0.75. Spots with Rf values 0.75 and 0.02 were majors (55.86% and 37.31% respectively). Hexane cold fraction also gave three peaks. The Rf values ranged from 0.02 to 0.63. The components with Rf values 0.02 and 0.63 were relatively abundant with area percent 83.95 and 11.50 respectively. Petroleum ether hot fraction gave three peaks, whose Rf values ranged from 0.00 to 0.66. Those with Rf values 0.66 and 0.00 with area percent 75.02% and 14.57% were the majors. The analysis of petroleum ether cold fraction gave only two peaks. The Rf values were 0.02 and 0.75 with an area percentage of 76.64% and 23.36% respectively. For ethyl acetate hot extract, the analysis produced eight peaks. Out of these components, those with Rf values 0.32 and 0.67 with area percent 25.08 and 23.85 respectively were the majors. Ethyl acetate cold fraction gave two peaks only with Rf values 0.02 and 0.67 having area percentage of 40.23 and 59.77 respectively. Methanol hot fraction exposed nine peaks whose Rf values ranged from 0.02 to 0.72. Here Rf values 0.02 and 0.34 were the majors with area percentage of 30.63% and 21.44% respectively. Analysis of cold methanol fraction resulted in seven peaks. The Rf ranged from 0.03 to 0.73. Spots with Rf values 0.03 and 0.31 were the majors with area percentage of 56.94 and 25 respectively. HPTLC Fingerprint for Saponins: The HPTLC spectrum for various extracts was illustrated in Fig. 4, and the Rf values of different peaks were given in Table 5. HPTLC analysis of hot hexane fraction exhibited only two peaks, whose Rf values were 0.02 and 0.81 with area percentage of 15.47 and 84.53 respectively. Hexane cold fraction revealed only one peak at Rf 0.02. Petroleum ether hot extract showed four peaks whose Rf values ranged from 0.01 to 0.82. The components with Rf values 0.16 and 0.01 were the majors with 42.08% and 21.55% respectively. Petroleum ether cold extract produced only one peak at Rf 0.03. The development of ethyl acetate hot fraction exhibited eight peaks with Rf values ranging from 0.03 to 0.83. Among them, those with Rf values 0.26 and 0.53 were more predominant with an area percentage of 26.55 and 16.06 respectively. The cold fraction of ethyl acetate gave only three peaks whose Rf values ranged from 0.03 to 0.56. Spots with Rf values 0.03 and 0.56 were the majors with area percentage of 59.61 and 22.24 respectively. Methanol hot fraction resulted in ten peaks, with Rf ranging from 0.02 to 0.74. There were two relatively predominant peaks at Rf values 0.03 and 0.31 with area percentages 26.45 and 26.42 respectively. Analysis of cold methanol fraction revealed five peaks. The Rf values ranged from 0.03 to 0.59. The components with Rf values 0.03 and 0.28 were relatively abundant with area percentage of 65.09 and 19.66 respectively. HPTLC Fingerprint for Tannins: The analysis of hot hexane fraction revealed only two peaks. Their Rf values were 0.02 and 0.96 with area percentages 92.02 and 7.98 respectively. In the case of cold hexane fraction, three peaks were observed whose Rf values ranged from 0.02 to 0.80. The spots with Rf values 0.02 and 0.37 were the majors with area percentage of 73.04 and 18.95 respectively. When petroleum ether hot fraction was developed, it gave three peaks, with Rf ranging from 0.00 to 0.16. The major peaks were observed at Rf values 0.16, and 0.00 whose area percentage were 40.84 and 34.25 respectively. For petroleum ether cold fraction, three peaks were obtained Rf values ranging from 0.02 to 0.53. The components with Rf values 0.02 and 0.53 were relatively abundant because their area percentages were 44.82% and 33.26% respectively. When ethyl acetate hot fraction was developed, eight peaks were observed. Rf values ranged from 0.02 to 0.90. Among them, those with Rf values 0.13 and 0.02 were more predominant with an area percentage of 41.64 and 15.38 respectively. But ethyl acetate cold fraction gave only one peak at Rf value 0.02. Analysis of hot methanol fraction revealed nine peaks whose Rf values ranged from 0.03 to 0.94. The phytoconstituents with Rf values 0.03 and 0.11 were the major with 35.14% and 24.77% respectively. Methanol cold fraction produced six peaks with Rf values ranging from 0.03 to 0.77. The major peaks were observed at Rf values 0.03 and 0.06 (area percent 53.27 and 38.22 respectively). 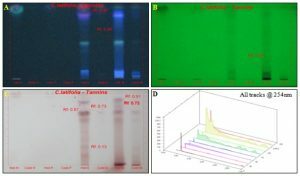 The results obtained from the HPTLC analysis of various extracts concerning tannins is given in Table 6, and the corresponding figures were represented in Fig. 5. DISCUSSION: Plants possess numerous bioactive compounds with a variety of pharmacological activities. Hence, their scientific validation is necessary for ensuring the quality and therapeutic efficacy. HPTLC analysis is the first step towards understanding the types of active principles present in a plant. Spectral analysis is used for the quality control and standardization of herbal formulations as it helps in detecting the adulterants 15. It is a valuable tool that provides chromatographic fingerprints which can be visualized and stored as electronic images 16. The chemical fingerprints developed through chromatographic methods is an approach to reveal the different phytoconstituents distributed in the plant material and to preserve the “database” for future studies 17, 18. Qualitative phytochemical screening of C. latifolia stem showed the presence of various phytochemicals such as flavonoids, coumarins, tannins, alkaloids, steroids, terpenoids, saponins, quinines, anthraquinones and phenols. Similar findings were reported from the aerial parts of C. quadrangularis 19. The present study is the first attempt to report the HPTLC fingerprint profile of C.latifolia stem extracts. HPTLC profile showed various peaks at 254 nm with specific solvent systems which revealed the presence of particular phytoconstituents. It also showed that methanol and ethyl acetate extracts contain more mixture of compounds when compared with hexane and petroleum ether extracts. Similar results confirming the presence of more phytoconstituents from methanol and ethyl acetate extracts were reported 20. HPTLC has proved as a novel, accurate, precise and sensitive method for the isolation of long chain aliphatic hydrocarbons from C. quadrangularis 21. In a recent study, HPTLC has been successfully employed for the quantification of phytoconstituents 22, 23. In C. latifolia the developed chromatogram is specific for the selected solvent system and can be utilized for the standardization of the extracts. This fingerprint profile along with the Rf values can be used as a reference standard in future works and can be used as a tool for detecting adulteration. CONCLUSION: Herbal drugs contain different groups of phytoconstituents which can show variability even between different parts of the same plant. This makes the process of standardization and quality control of herbal drugs a complex process. Hence developing a fingerprint of each extract can help in detecting the stability of the extract over time. In the present investigation, HPTLC fingerprint profile for eight extractive fractions of C. latifolia stem was developed. The fingerprint profile for alkaloids, flavonoids, phenols, tannins, and saponins developed through this study can serve as a diagnostic tool for the identification, quality evaluation and detection of adulterants of the plant. ACKNOWLEDGEMENT: The first author gratefully acknowledges University Grants Commission, New Delhi, Govt. of India, for sanctioning leave under FDP Scheme along with necessary financial assistance. CONFLICT OF INTEREST: There is no conflict of interest among all authors in this study. APG IV: An update of the Angiosperm Phylogeny Group classification for the orders and families of flowering plants. Botanical Journal of the Linnean Society 2016; 181: 1-20. Gerrath JM, Posluszny U, Ickert-Bond SM and Wen J: Inflorescence morphology and development in the basal rosid lineage Vitales. Journal of Systematics and Evolution 2017; 55: 542-558. Liu XQ, Ickert-Bond SM, Chen LQ and Wen J: Molecular phylogeny of Cissus of Vitaceae (the grape family) and evolution of its pantropical intercontinental disjunctions. Molecular Phylogenetics and Evolution 2013; 66: 43-53. Kunder PR and Vidya SM: Ethnomedicinal importance of rare family member of Vitaceae, Cissus elongata Proceedings of the Conference on conservation and sustainable management of ecologically sensitive regions of Western Ghats 2016; 409-416. Fernandes G and Banu J: Medicinal properties of plants from the genus Cissus: A review. Journal of Medicinal Plants Research 2012; 6: 3080-3086. Shukla R, Pathak A, Kambuja S, Sachan S, Mishra A and Kumar S: Pharmacognostical, Phytochemical and Pharma-cological Overview: Cissus quadrangularis Ind Jou of Pharmaceutical and Biological Res 2015; 3: 59-65. Soladoye MO and Chukwuma EC: Quantitative phytochemical profile of the leaves of Cissus populnea & Perr. (Vitaceae) – an important medicinal plant in Central Nigeria. Archives of Applied Science Research 2012; 4: 200-206. Elela MEA, Orabi MAA, Abdelkader MSA and Darwish FMM: Phytochemical screening and HPTLC studies of Ceiba pentandra (L,) Gaertn. variety pentandra cultivated in Egypt. Journal of Pharmacognosy and Phytochemistry 2015; 4: 10-17. 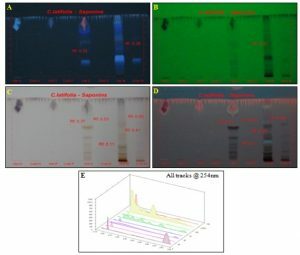 Kulkarni KM, Patil LS, Khanvilkar VV and Kadam VJ: Fingerprinting techniques in herbal standardization. Indo American Journal of Pharmaceutical Research 2014; 4: 1049-1062. Narayanan J and Antonysamy JM: HPTLC fingerprint profile (Phenolics) of selected Cyathea species from Western Ghats, South India. Chinese Journal of Biology 2016; 1-7. Harborne JB: Phytochemical methods- A guide to modern techniques of plant analysis. Chapman and Hall, London, 1984. Wagner H and Bladt S: Plant Drug Analysis-A Thin Layer Chromatography Atlas. Springer-Verlag New York, Second edition 1996. Reich E and Schibli A: High-performance thin-layer chromatography for the analysis of medicinal plants. Thieme, New York 2007. Chanda S, Baravalia Y and Nagani K: Spectral analysis of methanol extract of Cissus quadrangularis stem and its fractions .Journal of Pharmacognosy and Phytochemistry 2013; 2: 149-157. Manikandan A and Doss AVA: Evaluation of biochemical contents, nutritional value, trace elements, SDS- PAGE and HPTLC profiling in the leaves of Ruellia tuberosa and Dipteracanthus patulus (Jacq.) 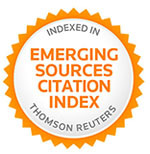 Journal of Chemical and Pharmaceutical Research 2010; 2: 295-303. Tiwari S, Bhadoriya U, Saini L, Gupta A and Solanki S: Quantitative analysis of glycyrrhizic acid by HPTLC in herbalAsian Journal of Pharmacy and Life Science 2011; 1: 124-127. 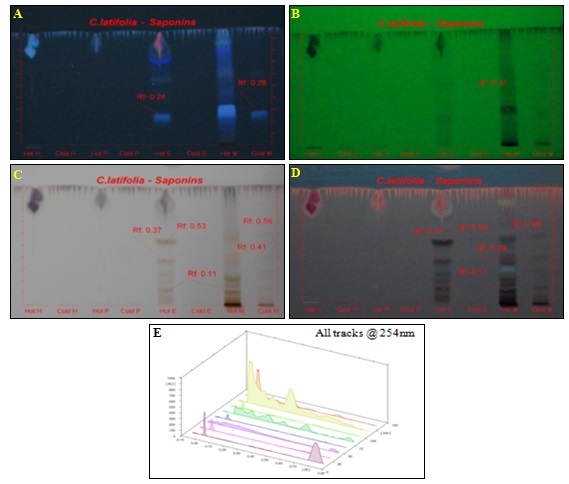 Prakash KC, Garg SK, Yadav P, Dey A and Dey S: Studies on chromatographic fingerprint analysis and antibacterial activity of Adhatoda vasica leaves extracts. Pharmacology online Newsletter 2011; 3: 1322-1329. Vijayalakshmi A, Kumar PR, Sakthi PS and Meenaxshi C: Pharmacognostic and Phytochemical investigation of the aerial parts of Cissus quadrangularis Journal of Scientific and Innovative Research 2013; 2: 872-879. 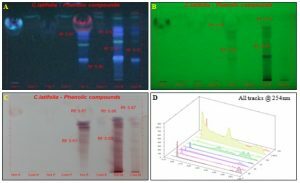 Seasotiya L, Siwach P, Malik A, Bai S, Bharti P and Dalal S: Phytochemical evaluation and HPTLC fingerprint profile of Cassia fistula. 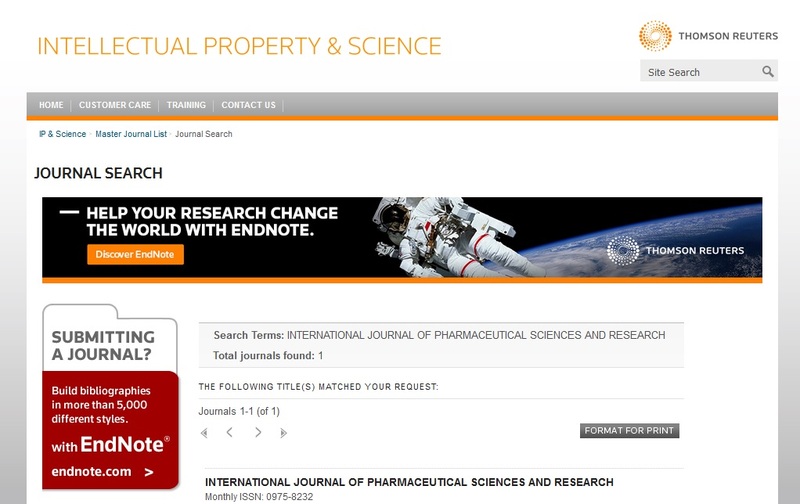 International Journal of Advances in Pharmacy, Biology and Chemistry 2014; 3: 604-611. 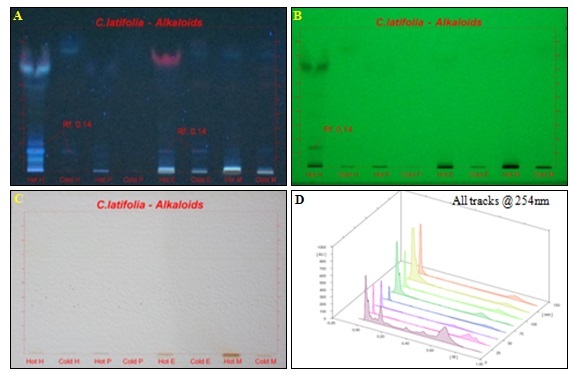 Jain V, Kinjawadekar V and Laddha K: A novel high – performance thin layer chromatography method for quantification of long chain aliphatic hydrocarbons from Cissus quadrangularis. Journal of Pharmacy and Pharmacognosy Research 2016; 4: 159-164. Alambayan J, Vats M and Sardana S: HPTLC quantification and Phytochemical investigation of roots of Acacia catechu International Journal of Pharmaceutical Sciences and Research 2015; 6: 2998-3004. Lebot V, Michalet S and Legendre L: Identification and Quantification of phenolic compounds responsible for the antioxidant activity of sweet potatoes with different flesh colors using high-performance thin layer chromatography (HPTLC). Journal of Food Composition and Analysis 2016; 49: 94-101. Kuruvilla J, Iyer RS and Anilkumar M: Phytochemical evaluation and HPTLC fingerprint profile of Cissus latifolia lam. Stem. Int J Pharm Sci & Res 2019; 10(2): 568-77. doi: 10.13040/IJPSR.0975-8232.10(2).568-77.